Beginning on or about Monday, April 15 and continuing until Wednesday, August 7, Dulles Corridor Metrorail Project (DCMP) crews will be performing utility work across Lockridge Road in Loudoun County, requiring the full closure of a portion of Lockridge Road. 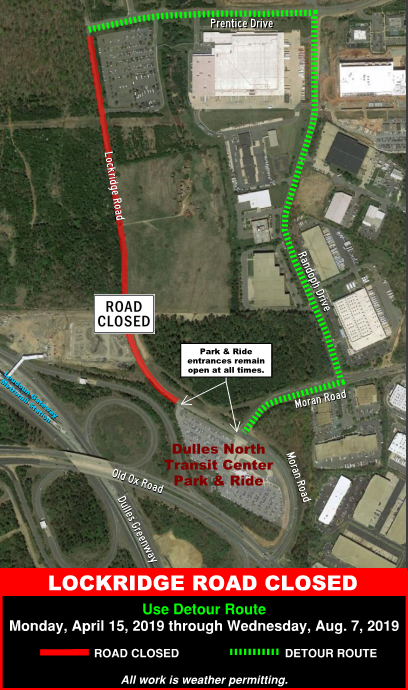 Starting at the northwest entrance to the Dulles North Transit Center Park and Ride facility and continuing north for 6/10 mile, Lockridge Road will be closed. The detour will be in place during the daytime and nighttime hours for approximately four months between the dates listed above.